The Lexington-Fayette County Board of Health and the Lexington-Fayette Urban County Council recently honored the health department’s 2014 Public Health Heroes, Baby Health Service and the Rev. Willis Polk with Imani Family Life Center. Several Lexington-Fayette County Health Department (LFCHD) employees traveled to Louisville the week of April 14 to represent the department at the annual Kentucky Public Health Association Conference. During the conference, the LFCHD, along with a few other health departments, received the Department for Public Health’s Commissioner’s Award for Quality Improvement in recognition of our outstanding efforts working towards Accreditation. Also at the conference, Angela Brumley-Shelton and Dustin Knight presented posters about tobacco cessation while Greg Hiles and Cristina Hiten presented a poster for part of a quality improvement education and awareness project. Kevin Hall and Hiles also served on a media panel to discuss how public health, social media and media in general work together. As part of Administrative Professionals Week, we would like to take a moment to thank the Lexington-Fayette County Health Department’s (LFCHD) administrative professionals for all they do. Commissioner of Health Dr. Rice Leach appeared on NewsTalk 590AM WVLK Live with Lee Cruise on April 23 to talk about a wide variety of public health issues and how the Lexington-Fayette County Health Department has been helping Lexington be well since 1904. Please take a moment to welcome the newest employees of the Lexington-Fayette County Health Department and HealthFirst Bluegrass. The 2014 Lexington-Fayette County Health Department Low-Cost Rabies Vaccination Clinic is less than three weeks away. We appreciate any help you can provide in helping us promote the clinic. How? It’s easy; there are several ways! We have event flyers available in half-size or full-size, and in English and Spanish. Have an event coming up that you can take these to? How about sharing them with your neighborhood association, apartment complex, church or local stores? Contact Greg Hiles if you would like to get copies of the flyers (please indicate which size and how many of each you would like). You can also help spread the word on social media. Follow us on Facebook at facebook.com/LFCHD or on Twitter @LFCHD and share some of our messages. Be on the lookout for LFCHD pets as they’ll be making their debut on these pages soon! As National Public Health Week (NPHW) draws to a close, take a moment to reflect on how all programs at the Lexington-Fayette County Health Department (LFCHD) deliver public health to the community by viewing the 2013 LFCHD Annual Report here (please be patient as download proceeds due to large file size). Pay special attention to the Milestones & Achievements and Testimonials pages to quickly view your team’s accomplishments (we encourage you to send in similar features to Kevin Hall or Greg Hiles year-round so that we can in turn share with your colleagues). Want a flashback to the first-ever annual report? Click here to check out the cover image from the 1938 booklet. And lastly, take a look at the image below of staff at 805 Newtown Circle, who posed in front of the banner employees were asked to sign at the April 7 NPHW kickoff meeting. The Lexington-Fayette County Health Department Public Health Team gathered this morning at 805 Newtown Circle to celebrate 110 years of helping Lexington be well. Celebrated for nearly 20 years, National Public Health Week (NPHW) takes place during the first full week of April every year to help spread awareness of the contributions of public health and to highlight important issues for improving the United States. The week is organized by the American Public Health Association (APHA) and includes events held by community health organizations across the county. Each weekday during NPHW sees specific importance placed on a single health topic to help spread awareness more effectively. 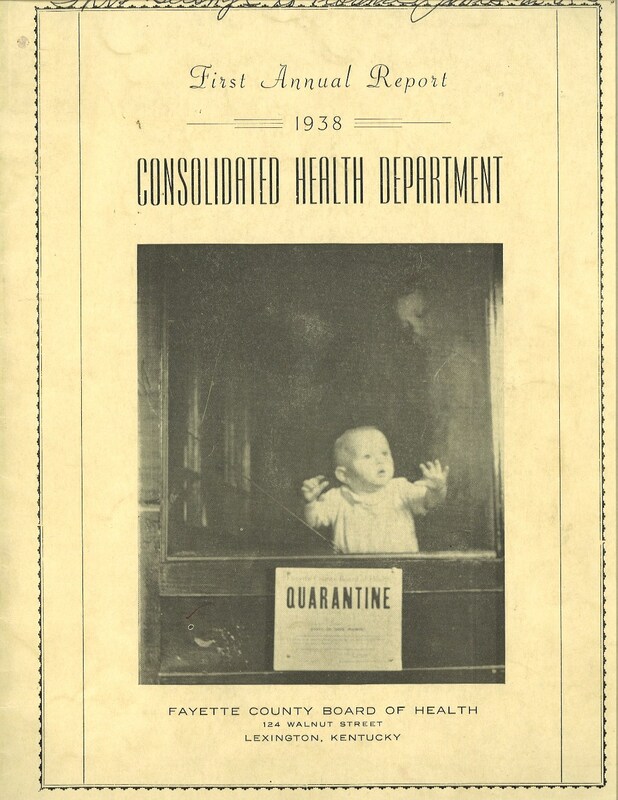 All week, make sure to find the Lexington-Fayette County Health Department at facebook.com/LFCHD or follow us on Twitter @LFCHD to help spread the word about the great ways we help Lexington be well, and how we’ve been helping the city be well since 1904. What are this year’s themes? Monday, April 7: Be healthy from the start. From maternal health and school nutrition to emergency preparedness, public health starts at home. Let us show you around. Tuesday, April 8: Don’t panic. Disaster preparedness starts with community-wide commitment and action. We’re here to help you weather the unexpected. Wednesday, April 9: Get out ahead. Prevention is now a nationwide priority. Let us show you where you fit in. Thursday, April 10: Eat well. The system that keeps our nation’s food safe and healthy is complex. We can guide you through the choices. Friday, April 11: Be the healthiest nation in one generation. Best practices for community health come from around the globe. We have a world of public health to show you. How do your colleagues at the Lexington-Fayette County Health Department honor these themes year-round? Check back with Healthy Times this Friday, when we’ll reveal the latest LFCHD Annual Report. One look and you’ll quickly see how your team makes it happen! Please take a moment to welcome the newest employees of the Lexington-Fayette County Health Department and HealthFirst Bluegrass, and to congratulate those who have been promoted recently.